One of the most striking and memorable features of Budapest’s beauty is the river that flows through it – the Danube. In the sunshine its swirling currents dance with gold. At night its black velvet surface mirrors the city lights. Under dark winter skies it is moody and mysterious. Spanned by lovely old bridges and with a tranquil, wooded island at its centre, it is the stuff of movies, poetry, song and romance. It’s easy to understand how it moved Johann Strauss to compose his famous Blue Danube Waltz. But that was in a different age, before the Danube became the busy waterway it is now. 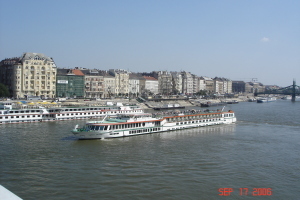 Surprisingly, before the 19th century, apart from bank to bank ferries, the Danube was not used as a means of transport or as an international trade route. With its strong currents, shifting sandbanks and unpredictable tides, it was considered too dangerous. It was Istvan Széchenyi who recognised the Danube’s potential as a trade route and its importance to the economic growth of Pest and of Hungary. He set about lobbying Vienna for political and financial support to promote the regulation of the river from Pest to the Black Sea, to create a navigable waterway. By the 1830s when work began project Széchenyi had become a leading figure on the project. He was appointed high commissioner and supervised the works until their completion. At the same time, he travelled to Constantinople and worked tirelessly to promote Hungarian goods and produce, to open up markets and to build up trade relations on the Balkan. Today, traffic roars along the banks of the Danube and across its bridges. Cruise ships carrying cocktail sipping passengers, tour boats blaring loud commentaries and barges loaded with cargo ride its currents up and down river. In the summer, sun-lovers bask on its beaches. But, still in cafes, bars and restaurants along its banks and in fact, all over Budapest, gypsy violins, bands and orchestras belt out the Blue Danube Waltz.